This image was brought to you thanks to Wikimedia and Creative Commons CCO License. Net Neutrality is the keystone issue in the movement of movements. It is poised to become as pivotal to our interconnected struggles as the Salt March was for Gandhi and the Indian Self-Rule Movement. This week, the FCC repealed Net Neutrality rules in blatant disregard of the 83 percent of US citizens who declared support for Net Neutrality. Overlooked for years, often misunderstood, Net Neutrality is as ubiquitous to our lives as salt was to Gandhi’s India. And the corporate state, our version of the tyrannical British Empire, might have just blundered into their undoing. The end of Net Neutrality is as odious to us as the British Colonial government’s monopoly on salt was to the Indians. Salt was an essential ingredient for preserving life and health in humid, pre-refrigeration India. Net Neutrality and classifying the Internet as a public utility is essential for fair, affordable, and equal access to the Internet, and thus, the life of US citizens, as well as our innovation, creativity, information, education, research, marketplace, exchange, dialogue, organizing, and so much more. Telecom giants like Comcast and Verizon have sought the end of Net Neutrality for years. This allows them to create a two-tiered system of Internet access, charging people for “fast lanes” and relegating everything else into “slow lanes”. The chilling effect this will have on our economy, research, movements, and society is incalculable. It is a massive advance for the corporate state’s takeover and privatization of all sectors of our nation. With it, they can control everything we see (or don’t see) through their greed. Money buys society in the capitalist world. For years, the Internet has opened up arenas of public space beyond what money can buy. The sheer volume of non-commercialized creativity and information online is staggering. It matches the incredible resources of the early commons. And, like the commons, the greedy have found a way to enclose them and charge us more and more for access. 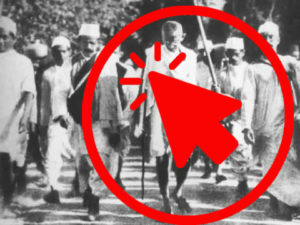 Gandhi’s Salt Campaign offers us a model of how to get out of this mess – not just from the odious injustice of the end of Net Neutrality, but also from the tyranny of corporate rule. In 1930, salt was a keystone, yet stealth issue. When the Indian National Congress tasked Mohandas K. Gandhi with planning a new campaign against the British Empire’s colonial rule, no one expected the Salt Satyagraha would unravel the empire that the sun never set upon. Even Gandhi’s buddies were skeptical about salt. As for Lord Irwin, Viceroy of India, he famously stated that he wouldn’t lose any sleep over salt. Instead, he lost the country. Salt was an unexpected issue, but it touched every Indian citizen’s life. And, when Gandhi announced that he was going to use civil disobedience to directly disobey the “odious salt laws” and render them unenforceable through mass noncooperation, millions of ordinary Indians cheered. In defiance of the salt laws, they made, sold, and bought salt. Even more importantly, they openly refused to obey the British Empire and thus ousted the Brits from authority. This showed the Indians what Gandhi had been saying for decades: a paltry hundred thousand British cannot rule over 320 million Indians without the Indians cooperation. Deny your support, and British rule will crumble. Fast forward to contemporary United States, which also has 320 million people and faces a parallel of colonial rule in the corporate state. In the case of telecom giants like Verizon and Comcast, well, they’re enjoying a monopoly on our modern-day salt of Internet access. With the repeal of Net Neutrality, they’re positioned to do like the British and start charging us for something we need for everyday life and survival. But we can pull a Gandhi and make salt. The Salt Satyagraha combined what’s known as constructive program and an obstructive program of civil disobedience to unjust laws. The Indians made salt (constructive) and broke the law en masse (obstructive). They marched, demonstrated, protested, wrote essays and made speeches about salt, using those acts of protest and persuasion to connect the issue of the salt laws with the need to end British rule. We can do the same with Net Neutrality. We can “make salt” by supporting and building out local community broadband. This is already being done in many poor rural and urban communities that were ignored and marginalized by telecom giants seeking bigger profits in wealthier areas. Support this effort. It is needed in both the short and long term for breaking the telecom giants’ monopolies and putting more diverse and democratic control into our Internet. We can defy en masse the corporate state’s attempt at colonial exploitation of US citizens. Governor of Washington State Jay Inslee just announced a plan of action to uphold Net Neutrality standards in defiance of the FCC. California Senator Scott Wiener plans to introduce similar legislation in January. Support a similar effort in your state. These will be vitally important in reinstating Net Neutrality not just through the FCC, but as a long-term industry standard. We can also pressure our Congress Members to use the Congressional Review Act to pass a “resolution of disapproval” that overturns the FCC decision in the next 60 days. We can also support the state-led lawsuits against the FCC. Perhaps most importantly, we can connect the issue of Net Neutrality with the bigger problem of corporate control. In our protests, marches, demonstrations, online posts, articles, and discussions we need to make the connection known: we are being ruled over by a corporate state that has ended citizen democracy in the United States. If, like Gandhi and the Indians, we wish to cease being a colony (of corporations in our case) and implement democratic self-rule, we need make sure every one of our fellow citizens sees the repeal of Net Neutrality as a symbol of the greed and corruption of corporate rule. The struggle ahead of us is challenging . . . and vitally important to our lives. Take heart from the example of salt. Use it to take action today. When we organize, we win, as Popular Resistance founders and Net Neutrality campaigners Margaret Flowers and Kevin Zeese say. Net Neutrality is our salt. Let’s use it to end corporate rule. Author/Activist Rivera Sun, syndicated by PeaceVoice, is the author of The Dandelion Insurrection and has just launched the sequel, The Roots of Resistance. What a great analogy, using the Salt March as inspiration for social change. It’s the little things – like internet access – that everyone can relate to which make for broad movements of social change. The Salt Campaign also encouraged people to reject the giant monopoly that cranked out industrial salt and buy locally produced products instead. Even if it was was more expensive and of lower quality (much like the homespun cloth Gandhi promoted over British textiles) it was an important action that everyone could take to show support for the movement as a whole. The little sacrifices gave people skin in the game and made them more committed to the cause – so committed, in fact, that more that 60,000 Indians went to jail during the Salt Campaign… forcing the British government to negotiate with the people as equals.